PRKAR1A antibody recognizes cAMP-dependent protein kinase type I-alpha regulatory subunit, also known as Carney complex type 1, cAMP-dependent protein kinase regulatory subunit RI alpha, or protein kinase A type 1a regulatory subunit. Mouse anti Human PRKAR1A antibody recognizes the cAMP-dependent protein kinase type I-alpha regulatory subunit, also known as Carney complex type 1, cAMP-dependent protein kinase regulatory subunit RIalpha, cAMP-dependent protein kinase type I-alpha regulatory chain, cAMP-dependent protein kinase type I-alpha regulatory subunit, protein kinase A type 1a regulatory subunit and tissue-specific extinguisher 1.
cAMP is a signaling molecule important for a variety of cellular functions. cAMP exerts its effects by activating the cAMP-dependent protein kinase, which transduces the signal through phosphorylation of different target proteins. The inactive kinase holoenzyme is a tetramer composed of two regulatory and two catalytic subunits. cAMP causes the dissociation of the inactive holoenzyme into a dimer of regulatory subunits bound to four cAMP and two free monomeric catalytic subunits. Four different regulatory subunits and three catalytic subunits have been identified in humans. PRKAR1A encodes one of the regulatory subunits. This protein was found to be a tissue-specific extinguisher that down-regulates the expression of seven liver genes in hepatoma x fibroblast hybrids. Mutations in PRKAR1A gene cause Carney complex (CNC). PRKAR1A can fuse to the RET protooncogene by gene rearrangement and form the thyroid tumor-specific chimeric oncogene known as PTC2. A nonconventional nuclear localization sequence (NLS) has been found for this protein which suggests a role in DNA replication via the protein serving as a nuclear transport protein for the second subunit of the Replication Factor C (RFC40). Several alternatively spliced transcript variants encoding two different isoforms have been observed (provided by RefSeq, Jan 2013). 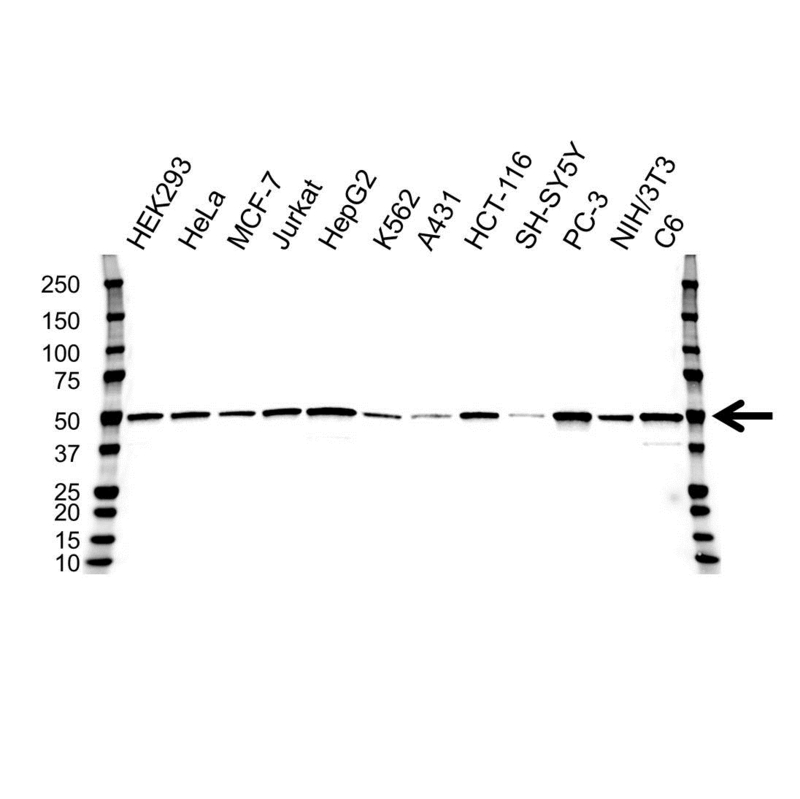 Mouse anti Human PRKAR1A antibody detects a band of 43 kDa. The antibody has been extensively validated for western blotting using whole cell lysates.